The hr tag should come between the title and the paragraph. i have same issue and it didnt work! why ? I am also having troubles getting past this lesson. The hr tag should come between the title and the paragraph. but failed this one? I cant find any tips on what I am missing, or if its an error on the site. This worked for me, I guess their test case uses this order. Lol, yes the HTML surprised me as well, when posted original question. That is why you see the screenshot. Thank you for your response, fixed the issue. 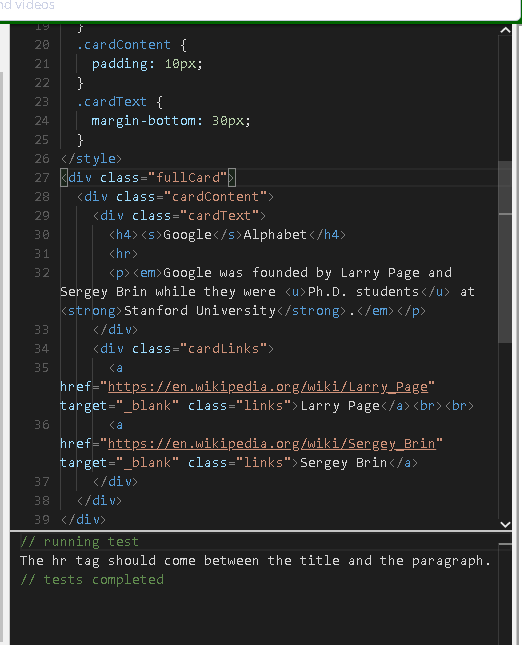 After you put the < HR> in and its still not working try to swap the < p >< em > to < em >< p > in the paragraph section. tag in worked for me. I don’t understand why let em tag wrap p tag can resolve this quiz. is It a error/bug of this challenge? Oh. I see. Someone reported this bug. Reset all the code. Then, to swap the < p >< em > to < em >< p > in the paragraph section. then, use hr tag between h4 and p it will work.